Here at Apprising Ministries I do my best to monitor Intel along this Internet Front and report back what I’m seeing as an assist to local pastors bombarded with all kinds of things and who just don’t have this kind of time. There’s no shortage of spiritual shenanigans going on right now. I’ve covered Cahn and his TH before, so I’ll just refer the interested reader to The Harbinger: Prophetic Fact Or Fickle Fiction? Here I’ll simply share again that, in my opinion, the best critique of TH was done by David James, executive director of The Alliance of Biblical Integrity. James’ dead-on-target review of TH was called The Harbinger: Fact or Fiction? In fact, it was actually an abridged version of a book that has now come forth, it’s also entitled The Harbinger: Fact or Fiction? Which brings us to the matter at hand concerning Dave James and his book. The fact is, Jonathan Cahn and his speculations presented as prophecy in TH have also been the source of a growing friction even within the camp of online apologetics and discernment ministries as I showed you a while back in Jonathan Cahn Harbinger Of Discernment Gone Wild? Cahn remains silent; neither agreeing with, or correcting, the comment. To me, this somewhat obscures his real motivation for TH, which then serves to keep this work mostly hidden in the shadows. By not responding to the interviewers one way or the other Jonathan Cahn can then claim he personally never said he was a prophet, etc. In Apprising Ministries pieces like Jim Bakker’s Homage To Jonathan Cahn Who Says He’s Blessed By Bakker’s Mentoring I pointed out that this kind of thing gives reason to doubt Cahn’s a prophet of God. Are we seriously supposed to believe that God Launched The Harbinger Book Using Jim Bakker? So if you have such cases, why do you lay them before those who have no standing in the church? I say this to your shame. Can it be that there is no one among you wise enough to settle a dispute between the brothers, but brother goes to law against brother, and that before unbelievers? The following is an excerpt from the lead article by T.A. McMahon in the February edition of The Berean Call monthly newsletter. Although for decades we at TBC have been exhorting and encouraging believers to be Bereans (i.e., to check out everything they are being taught by searching the Scriptures-Acts 17:10-11), we too have experienced the increased intensity of the spiritual battle and witnessed its exponential growth. The latest issue, which we submit to you for prayer support, is a threatened lawsuit over the book we published by David James (The Harbinger: Fact or Fiction?). The complaint is that the author used too many quotes from the New York Times best-selling book, The Harbinger, without permission from author “rabbi” Jonathan Cahn and publisher Charisma Media Publications (CMP). The complaint further states that our use of the quotes has inhibited the sales of The Harbinger and has thus financially damaged Cahn and CMP in an amount yet to be determined. In effect, we are being told that we must limit our documentation in warning the body of Christ of the biblical errors in The Harbinger. In other words, we cannot be Bereans or like the watchman of Ezekiel 3:17-19 without Cahn’s permission. This is the first time in my 35 years of working with Dave Hunt and our addressing nearly every major religion, religious cult, aberrational Christian sect, unbiblical trend, religious publication, book, media production, etc., that any organization or individual has even hinted at suing us. Now, however, we are being threatened with legal action by those claiming to be in the church. More critical than the unbiblical action of a brother threatening to take another brother to court (1 Corinthians 6) is the issue of preventing the biblical evaluation of a work that is influencing hundreds of thousands of professing and confessing Christians, as well as those who don’t profess to know Christ. We have hired a copyright attorney to address the legal issues and have responded to the attorney for Cahn and CMP. Even so, we covet your prayers that the Lord will be glorified throughout the process. In October we received the first letter from Charisma’s lawyer concerning my use of quotes from The Harbinger. This threat of litigation was followed by two additional letters about a month apart making various demands for specific information concerning sales of my book and actions that we must take, including specific deadlines for compliance. So, although this is the first time we have made this issue public in writing, we have had these threats hanging over our heads for several months. 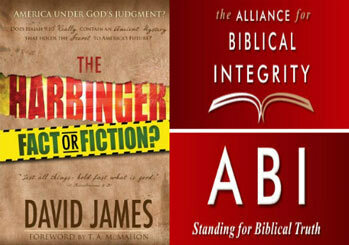 Our client learned that you, along with author David James, are using a strikingly similar book cover design of The Harbinger in commerce in connection with your book The Harbinger: Fact or Fiction. The book cover of The Harbinger: Fact or Fiction infringes Charisma’s intellectual property rights in the trade dress of its book The Harbinger. No doubt exists that the cover for your book The Harbinger: Fact or Fiction is designed to confuse consumers into thinking that either (1) this book is actually The Harbinger and/or (2) that the book is sponsored, affiliated with or approved by Charisma. The basis for the threat of legal action involves two primary points: 1) that we intended to confuse consumers and 2) that consumers would actually be confused. Regarding the first charge, it is pure speculation with no supporting evidence whatsoever. But more importantly, it is both judgmental and factually wrong. There was never any intention by anyone to deceive, mislead of confuse. A comparison of the two covers (shown below) makes this obvious. Regarding the second charge, once again, even a cursory glance makes it clear that my book is a direct negative response to The Harbinger, and therefore, obviously neither produced by nor endorsed by Charisma Media. Of course, we wanted people to understand that my book is about The Harbinger, but almost every design element of my cover was intentionally different to avoid any question of copyright infringement. However, as a demonstration of good faith we changed the cover without a fuss. Of course, because of our belief that it is vitally important for my book to be available as a response to The Harbinger,and given the threat, we were also concerned that the Charisma lawyers might try to tie things up in the courts and thus keep my book off the market. Now, in an unexpected and inexplicable turn of events, the Charisma attorney claims in the most recent letter (of January 22) that the fact that we changed the cover is itself an admission of guilt on my part that we had indeed infringed copyright. Once again, this is not only pure speculation, but the allegation is factually wrong because neither I nor The Berean Call have ever believed that we ever violated Charisma’s trade dress. We did not intend to violate copyright. We intentionally sought to avoid violating copyright. And we continue to believe that we were completely successful in not violating copyright. So, the charge that we admitted guilt in this matter is difficult to comprehend – even baffling. One would certainly hope that before threatening any kind of legal action Steve Strang et al would at least make the time to get their facts straight. In any event, Apprising Ministries is pleased to come alongside our brother Dave James; and we also encourage you to join us in prayer for this sad situation. One thing we do know is that my book is presently the only one that has been written and published which exposes the many significant problems in The Harbinger. And as the influence of The Harbingerin America continues to increase, the need for people to also read The Harbinger: Fact or Fiction? is greater than ever. We hope you will take time to read it if you haven’t – and if you do, please take time to leave a brief review on Amazon.com because these are extremely important in the process of getting the message into the hands of more and more people. Once again, we covet your prayers, not only in relation to the threatened legal action against us, but also concerning getting the important information in my book into the hands of believers who have been influenced, confused and misled by The Harbinger, the accompanying DVD and the dozens of interviews and messages by Jonathan Cahn. You can read Dave James’s post in its entirety right here.